Did you know that New Orleans has a Running of the Bulls? Now, New Orleans does not do anything like any other state or country and the San Fermin in Nueva Orleans Running of the Bulls definitely is unlike anything you have ever seen. 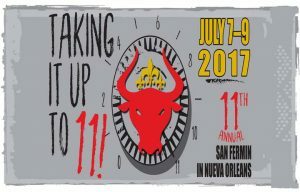 The 11th Annual Running of the Bulls at San Fermin in Nueva Orleans (SFNO) is the city’s most incredible Summer Spectacle! Thousands of runners take to the streets of New Orleans as they run away from the bulls. But, these bulls are RollerBulls or more accurately roller derby skaters with horns on their helmets and plastic bats in their hands. In is not quite clear if the object is to get away from the RollerBulls are get caught by them. On Saturday morning, July 8, 2017, you will start to see the runners gathering at the Sugar Mill around 6:30am and at 8am SHARP, the Big Easy RollerBulls are released from the den and hit the streets looking for runners wearing red sashes. You can expect to see 18,000 participants and 400 Roller Bulls. The runner’s uniform consists of white shirt, white pants or shorts, and a piece of red cloth or sash around the neck or waste. If you have survived the Encierro, you can head over to the Sugar Mill and enjoy DJ RQaway, music from the Zydepunks, food and more fun. All proceeds from the event will go to Beth’s Friends Forever and Animal Rescue New Orleans. Click Here for More Details. The Mulate’s Team loves everything New Orleans and the San Fermin in Nueva Orleans Running of the Bulls is definitely a great event for great local causes.